Viktor & Spoils is a modern Mexican taqueria and tequila bar serving classic and new style tacos alongside a world-class tequila and mescal selection. Part of the Hotel on Rivington, visitors enter through a red unmarked door plastered with Mexican pesos. 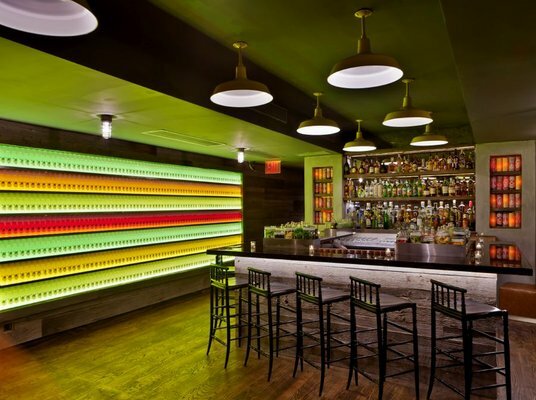 This leads to a lounge/bar, with walls made of barn wood and colourful rows of Jarritos soda. The brainchild of the Guerrilla Culinary Brigade, Viktor & Spoils is named after an agave farmer in the Mexican state of Guanajuato. While exploring Mexico for inspiration and research, Alan Philips and Jason Apfelbaum spent the days with Viktor, his family, and his dog Spoils; sampling the old man’s home brewed mezcal, learning his wife’s recipes, and understanding the love he has for his country and culture. It was there that the idea for Viktor & Spoils was born. The cocktail menu has been put together by Steve Olson, the world’s leading expert on tequila and mescal (which are actually both made from types of Agave plants, but different varieties – Tequila uses Blue Agave, while Mescal uses Maguey) and acting wine and spirits consultant for Bon Appétit Magazine. Signature cocktail offerings include the Oaxacan Dream made of Vida Mezcal, Pineapple Juice, Cranberry, Lime, Agave shaken, tall, grilled pineapple; the La Vida Buena made with Vida Mezcal, Aperol, Carpano Antica, Orange bitters, and orange peel; the Anejo Smash made with Siete Leguas Anejo Tequila, Grand Marnier, lemon and mint; and the $69 Decadent Daisy made with Don Julio 1942 Anejo Tequila, Grand Marnier 100th Anniversary, Del Maguey Santo Domingo Albarradas Mezcal, fresh tangerine, fresh lime and agave. Executive Chef John Keller (CO-OP Food & Drink, Le Bernardin, Nobu) has created a globally influenced menu of tacos, taquitos, nachos, Elote corn, and churros. Signature menu items include Housemade Chorizo Tacos with Cilantro-Avocado Crema & Pickled Red Onion, Cactus Tempura Tacos with Aji Panca Sauce, Pickled Jalapeno, Radish, & Cotija Cheese, Lobster Taquitos with Charred Corn, Lime Mayo, Chili De Arbol, Cotija Cheese, and Fresh Lobster, and Spicy Scallop Tacos with Dynamite Sauce, Tobiko, and Fresh Avocado. Previous Post Message in a bottle.